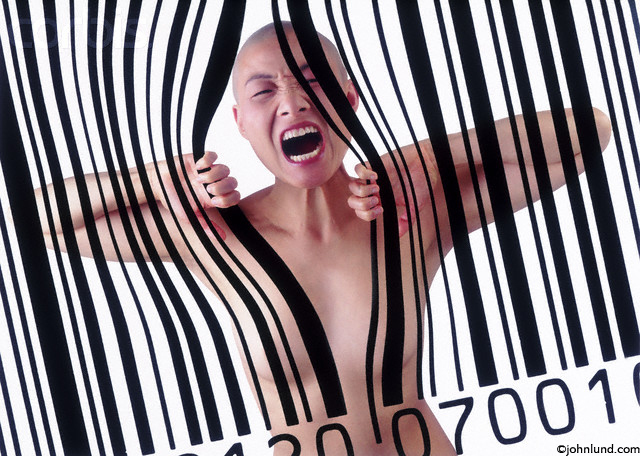 Somebody searched for the long tail keyword "person trapped behind a bar code" and ended up on finding this image on my site. The long tail keyword is key to pulling in large amounts of traffic to websites." Well over a thousand people came to my website today from various search engines. It can be both entertaining and informative to peruse the search terms that were used. Almost all of the search terms that bring people to my site are “long tail keywords”, keyword phrases of three or more words. Interestingly enough, although my site is all about stock photography, I don’t ever recall seeing the search term “stock photos” bringing anyone to my pages (the closest thing to that on this day was one search for “stock pics”). Most of the people who do find their way to my site don’t actually find what they are looking for, something reflected in my 72% bounce rate (which, from what I understand isn’t too bad). In some cases the searches seem so specific and unique, and yet fit some of my images so well, that it is hard to understand (artist’s bias here) why the person searching doesn’t go on to license the image. Some of those keyword phrases are so bizarre it one would never expect them to be searched for…and yet I do have stock photos that fit the phrases! I have put together an edited list of a dozen of the more entertaining and strange search phrases (long tail keywords) for this one day, as well as a list of a dozen of the very specific and often off-beat search phrases that fit images that I actually have in my stock photo collection (though those images still might not be what the person searching for really wants). In the case of the latter list I have linked the phrases to the images on my site that I believe meet the requirements of those searches. In each case the phrases are complete with the original spelling, capitalization and so forth. Of course, there are many searches that one would expect people to search for, and to find, on my site. These searches are for things like lighthouse in a storm, political elephant and donkey butting heads, and pics of hospital patients in traction. But they aren’t as much fun to peruse! 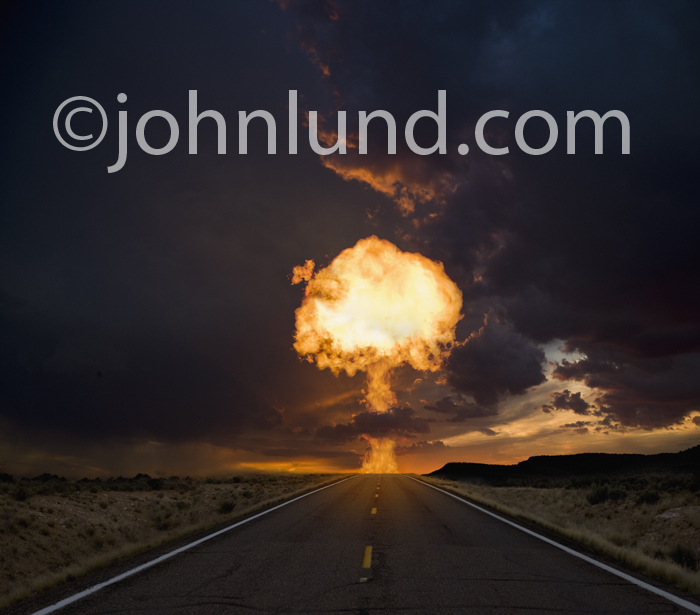 A negative stock photo such as this fiery mushroom-shaped explosion over a road ahead, can still generate excellent sales. The recent tragedy of the earthquake, tsunami and nuclear power plant meltdown in Japan got me to thinking about how I could make an image that could be used to bring attention to the dangers of radioactive accidents and other man made dangers. I wanted the image to be dramatic and iconic. While it was the nuclear accident that first prompted the idea, I also wanted this stock photo to work for other man made disasters as well. For radiation concerns a mushroom cloud would make perfect sense…and a fireball and explosion can represent all kinds of man-induced destruction. Such an image could be used to draw attention to everything from Nuclear power plant dangers to Predator drone missile strikes, to terrorist bombings to gas pipeline explosions. Having the fireball exploding over a road that stretches out into the distance can show that we are headed towards such disasters. Having the event happen at sunset can indicate that the end is near. In addition, the fiery clouds of a sunset can work to make the explosion fit more naturally into the environment. Having worked out the basics of the image in my mind I went to work searching my archives for the necessary raw materials…a fireball from a public “fire” performance, a long stretch of desert road from a road trip, and a sunset image from another road trip (road trips are great for stock photo raw materials). Creating the image was actually relatively simple and once again affirms my belief that Photoshop is easy when you have the right stuff (photos) to work with. I was able to build the mushroom shaped fireball explosion by using bits and pieces of a fireball photographed at a night performance that included the liberal use of fire. I used layer masks and the “Lighten” mode to blend the pieces together and composite them into the sunset. Next I put the road image into the sunset picture, again with layer masks. I used both “curve” and “Color Balance” adjustment layers, with masks, to create an orange reflection on the road. The Photoshop work took me about three hours to complete. Conventional wisdom has it that negative images don’t sell. While it is true that for the most part negative stock photos do not sell as well as positive pictures, in some cases they can sell quite well. One advantage this image has going for it is that there isn’t a lot of competition for it. To further bolster its potential market I crafted the image so that it can work as a horizontal, vertical or square. There is plenty of room for headlines, mastheads and body copy. The image is simple and powerful and is a quick read as a thumbnail, something very important in today’s Internet-centric world. I chose to submit this stock photo to Getty Images as a Rights Managed picture and it has been accepted for inclusion into the Stone collection. Finding your weak points, and bridging them, is a direct route to success. 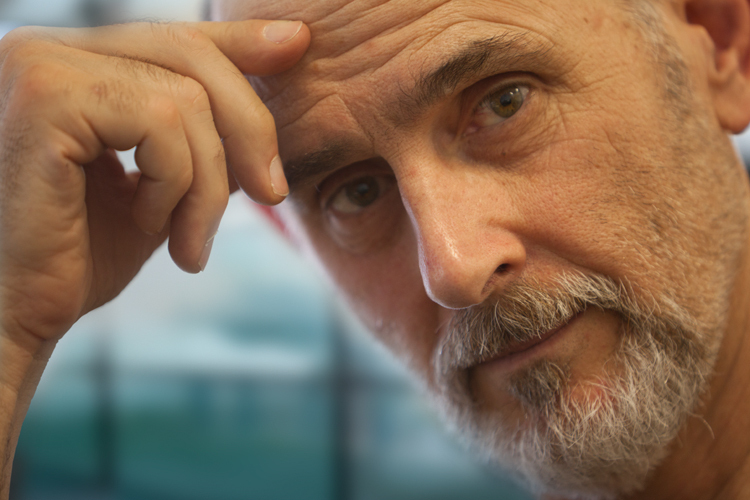 What aspect of your career is the most challenging for you? What knowledge gap do you have that is holding you back? What is your "weak link"? Find that weak link and turn it into a strength. Then find the next weak link, and make that into a strength. Anyone who actually does that cannot help but move up the ranks of success! Look at those problem areas in your career (and your life) as sign posts showing you the most direct route to success. 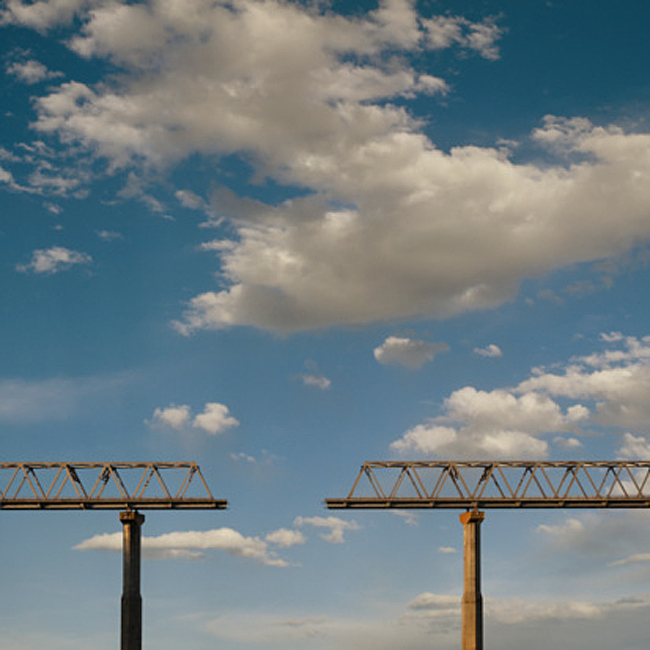 When I was doing a lot of assignment photography my biggest “gap” was in my negotiating ability. We are not talking a small gap here…more like the Grand Canyon! Many times I actually had art directors, after hearing my estimate, suggest that perhaps we could go a little higher. It was obvious to me that I had a problem that I had to deal with. Through a lot of personal work I was able to get marginally better at negotiating, but being a tough negotiator is not pleasurable for me and doesn’t come naturally. I solved my problem by going outside of myself. I “bridged that gap”, by getting a rep. Shortly after agreeing to work with my new rep I turned a negotiation in progress over to her. I had almost agreed to a job for $12,000.00, which was the total budget this particular client had for the job (or at least what they told me). My rep came back from the negotiations having secured $29,000.00 for two years of usage. That was ten years ago. By January of this year, after yet again re-negotiating the use, we have brought in somewhere in the neighborhood of $100,000.00. Sure, my (now former) rep has kept 30% of that as her share of the fees, but without her I would have settled for that original $12,000.00! My negotiating skills, though having improved over the last twenty years, are still abysmal. Another way that I have compensated is by turning to stock photography where all I have to worry about is making the images. The negotiating is all handled by agencies. Over the years that has worked very well for me…that is until the onslaught of the image glut and the fall of the barriers to entry (microstock) into stock photography. With this development comes an “opportunity” for me to work on another set of skills, skills that will help me compensate for the changes in this new world of stock photography. Now the knowledge gap facing me is the challenge of getting my work, my stock photos, in front of more people. So I am now “bridging” that gap by using my website to gain more visibility for my work…and to expand the ways in which I can monetize it. I have to master SEO (Search Engine Optimization), or at least get up to speed with it. Once I gain sufficient proficiency in that task I am quite confident that a new “opportunity” will present itself. And so it goes. What challenge faces you? That challenge just may be a sign pointing directly to success. Knuckle down and turn your weaknesses into strengths. If you can do that there will be no stopping you.